What a fun year it has been here on the blog! I posted almost one hundred new recipes along with some party, DIY, craft and homemade gift posts. I thought it'd be cool to take a look back through our thirteen most-popular recipe posts during the year. I'll soon be posting a 2013 recap that will include some other topics related to Joyously Domestic during the past year. For now, however, I wanted to share with you the opportunity to take a look back at the posts that were visited the most. P.S. You all have great taste ... these all are some of my personal favorites, as well! First up is my Roasted Ranch Potatoes with Bacon and Cheese post. I first shared this with you back in October of 2012 ... during the early months of my blog. But, it has continued - for over a year - to be our most-visited and most-popular post. I still cannot believe that it has been viewed almost 800,000 times here. It is an ultra simple recipe to throw together. It is my most-commented on, most-shared, most-stolen (that's another story all in itself) and most-pinned recipe. 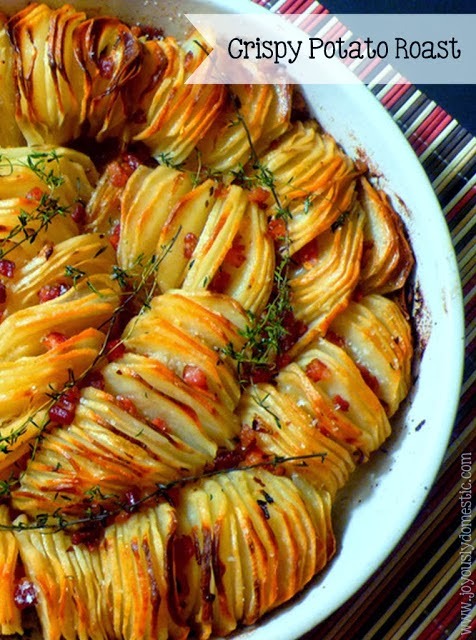 Another super popular recipe has been for my Crispy Potato Roast. I adore this recipe and so do my kiddos. It looks super impressive and is even more delicious. 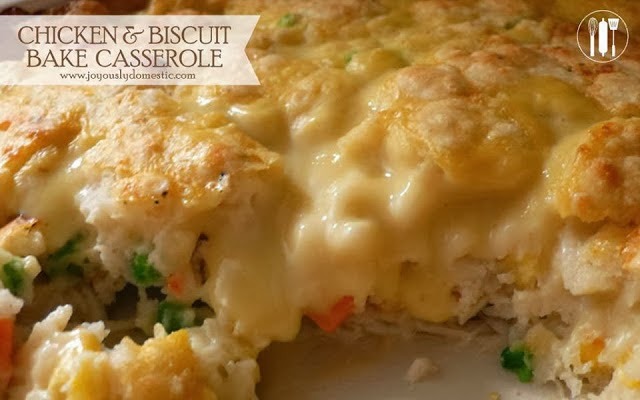 This is a family favorite in our home - my Chicken & Biscuit Bake Casserole. It combines two amazing comfort foods into one easy dish - Chicken Pot Pie and Chicken & Dumplings. This recipe has gotten tons of rave reviews on the blog. My Chicken and Spinach Pasta Bake is another reader favorite. This is such a versatile recipe. Substitutions and adaptations can be made left and right in this recipe - leave out the spinach, add in some mushrooms or leave out the chicken to make it vegetarian. 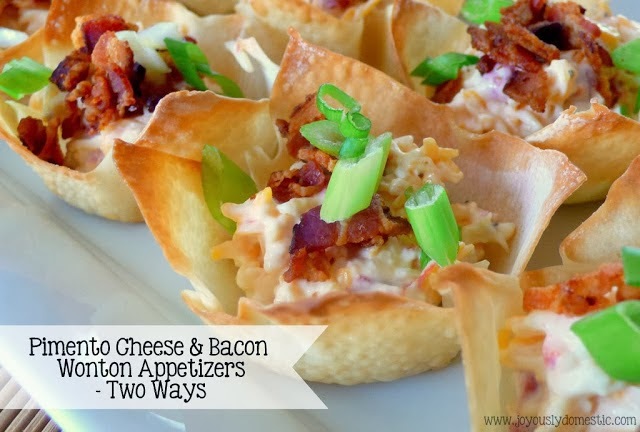 This recipe - for my Pimento Cheese & Bacon Wonton Appetizers - was one that I developed for Kroger Greek. These can be served hot or cold. They are perfect for parties and will be on my New Year's Even table this year for sure! My Ultimate Overnight Cinnamon Rolls have continued to be a hit here on Joyously Domestic. You prep these the night before and bake them off in the morning. We have these every year on Christmas morning. 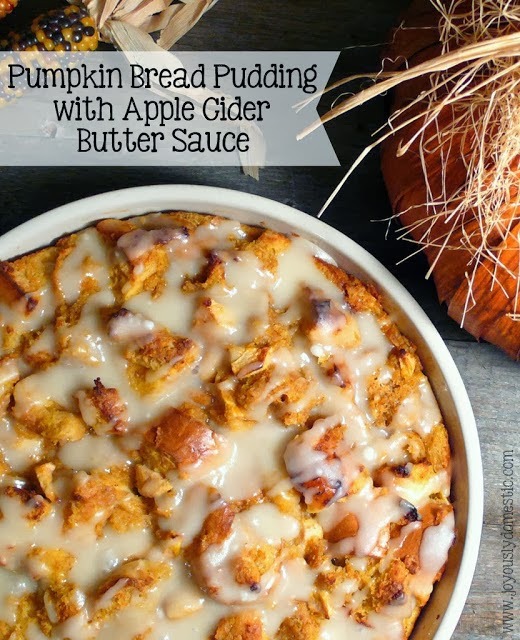 This Pumpkin Bread Pudding with Apple Cider Butter Sauce became incredibly popular during the fall months. I could eat this year-round, but that's exactly what I'd become - round(er)! It's a scrumptious recipe to make for either a dessert or brunch. And, it's a great way to use up leftover, day-old bread. 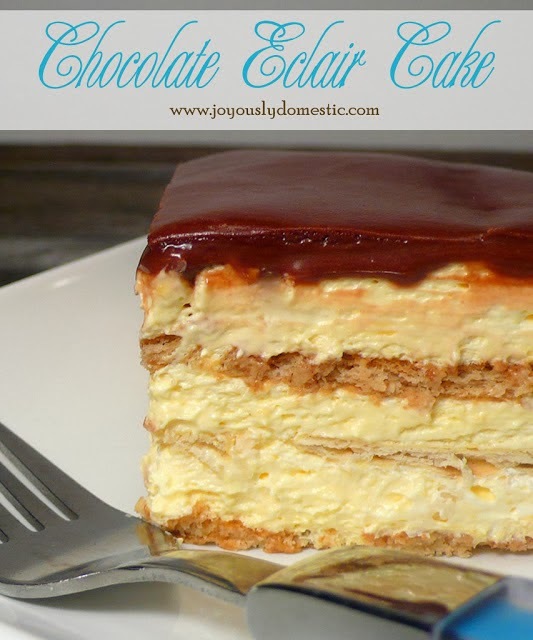 This No-Bake Chocolate Éclair Cake quickly become a fan-favorite ... as well as a favorite in the JD household. My fourteen-year old can now quickly throw this recipe together and it's always a crowd favorite whenever we serve it to guests. I love tacos. And, so do you all apparently! You made my Baked Tacos post one of our most-viewed this year. The post includes a couple of tricks for taking your tacos from average to amazing. During the summer months (don't you miss that warm sun? ), this "Veggie Overload" Pasta Salad was majorly popular. I made it weekly for most of the summer. It is so, so good. These Veggie Pizza Wonton Cups were, also, a hit. I adore these things and could eat the whole batch when I make them. As my loyal, long-time readers can attest, I love coming up with new recipes using wonton wrappers. These are easily one of my favorites. 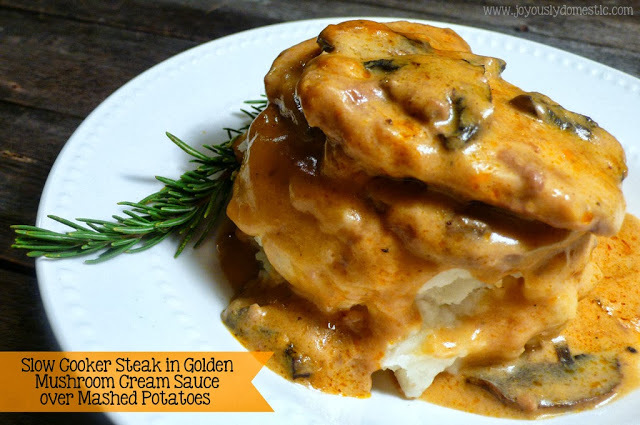 My Slow Cooker Steak in Golden Mushroom Cream Sauce was another popular post. This is a favorite of mine from my childhood. 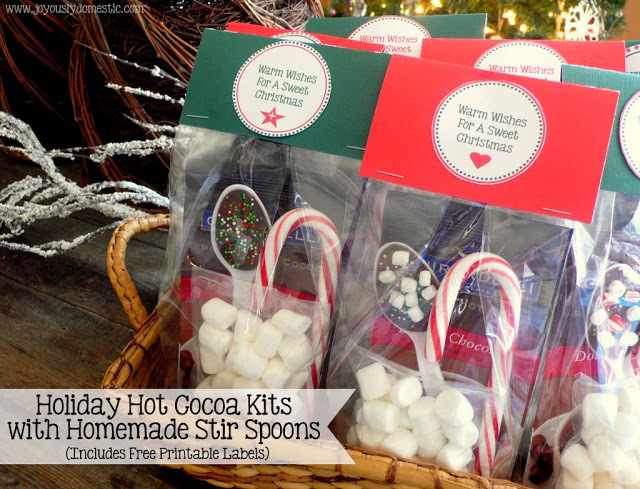 These Holiday Hot Cocoa Kits with Homemade Stir Spoons were easily the most-popular Christmas-related post. My kids had fun passing these out to their bus driver, teachers and friends this holiday season. I thank you for helping Joyously Domestic grow beyond my wildest dreams this year. Thank you for the comments, the shares, the "likes," the tweets and the love!